Derek and Hannah Jeter announced Monday that they are expecting their first child, in a column written by Hannah on The Players’ Tribune. 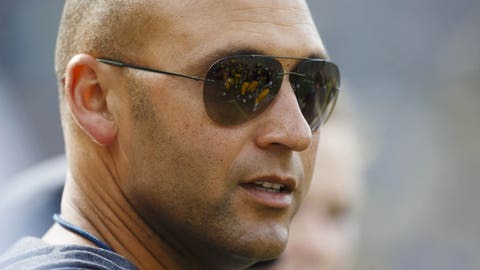 Since his retirement from baseball, legendary New York Yankees shortstop Derek Jeter has been just as busy as in his playing days. After launching The Players’ Tribune in 2014, Jeter married model Hannah Davis in 2016. Now, the couple are expecting their first baby this year. Hannah did not reveal how far along she is in her pregnancy, but she wrote that Derek has a name in mind for the baby girl. Upon his retirement in 2014, Jeter made it clear that he was intent on starting a family in his post-baseball life. Derek, 42, and Hannah, 26, married last July. Hannah stressed that she and Derek will look to make life for their baby as normal as possible, even in the spotlight the couple live in. Additionally, the Yankees will retire Jeter’s number on May 14. During his career, he won five World Series titles, was named to 14 All-Star teams and ended his 20-year run in MLB with 3,465 hits.